It’s the beginning of the first quarter and everyone’s on edge. Will the first play result in a touchdown? Will someone fumble? Wait… was that the sound of your friends and family around you grunting over an interception, or was it the sound of your growling stomach? Don’t “pass” interference within your own home – serve Ben’s Kosher Delicatessen Restaurant & Caterers “Big Game” food to keep your hunger satisfied and the game in play. Included with your order, you receive two salad selections, a pickle bowl and condiments. When you purchase a catering order for 12 or more, you get your choice of four dozen hors d’oeuvres from frankfurters in jackets, mini potatoes, spinach or kasha knishes (a value over $30) for free! Don’t forget to pick up some perfectly seasoned wings for an additional $8.99 per pound, juicy hot dogs or famous cold-cut sandwiches so you can focus on the game and not your hungry tummy. Lastly, Ben’s takeout counter is always open for football lovers looking for great sandwiches, wraps, hot entrées, salads, homemade soups and a bunch of other goodies. Phone and online orders are welcomed. For more information about Ben’s Big Game Season catered packages and other great Ben’s foods, visit www.bensdeli.net. Ben’s is a family-owned and operated delicatessen/restaurant company that has been serving up the finest authentic New York Kosher delicatessen products and eastern European comfort foods for more than 45 years. All of Ben’s sandwiches, soups and dinners are freshly prepared. Ben’s has seven convenient locations: three on Long Island in Carle Place, Greenvale and Woodbury, and one each in Midtown Manhattan; Bayside, Queens; Scarsdale in Westchester County; and Boca Raton, Florida with free delivery service available to many communities around the stores. 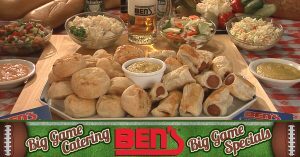 For more information, visit www.BensDeli.net or call Ben’s Catering Hotline at 1-800-344-BENS. Join our email list for special offers and to stay informed on what is happening with DOMG and other industry related news.